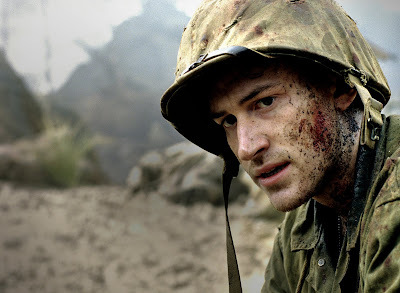 HBO's The Pacific premieres tonight. It's an exciting prospect for fans of Band of Brothers (2001). I missed that one during its original run. It wasn't until one of its frequent marathon runs on the History Channel last year that I caught a glimpse. I finally finished the remainder of the series last week during HBO's encore run leading up to tonight's premiere. Not long after HBO’s Band of Brothers debuted in 2001, Band writer Bruce McKenna was sharing a beer with Bill Guarnere, one of the World War II veterans whose story was depicted in the landmark miniseries. McKenna told the former paratrooper that he couldn’t believe what Guarnere and his Easy Company mates went through as they made their way across Europe. "Bill said, ‘You think we had it rough? You should talk to those boys who served in the Pacific,’" McKenna recalls. That quote was at one point going to lead off The Pacific, a Band companion miniseries nearly a decade in the making. And it remains the guiding principal followed by McKenna, Tom Hanks, Steven Spielberg and the rest of the team behind the new $250 million production. "This is Band of Brothers goes to hell," says McKenna. I don't plan on making the same mistake twice. The Pacific is definitly on the program tonight. Do any readers plan on watching it? Would you be interested in reviews of each episode? Let me know, and consider this an open thread for discussion about Band of Brothers or The Pacific. I'd be curious about your impressions of the series. Always well behind the rest of planet, I am just now watching Band of Brothers, I have seen the first 5 episodes, very good, but won't be catching The Pacific for a few years if I stay with current habits. Unfortunately, don't have HBO but my curiosity has certainly been piqued. I've seen parts of Band of Brothers, but never the whole thing. Perhaps when this comes out on DVD, I'll watch the two back-to-back. Speaking of which, it's interesting you put up Green Zone and this one after the other. Both have been causing quite a stir in the conservative blogosphere - Pacific not so much because of its content (though deductions have been made) but because of how Hanks' has been promoting it, comparing racism against the Japanese to today, and saying that we were out to annihilate them because they were different. Politics aside (or rather not aside but considered perhaps a bit more deeply than Hanks and his attackers have allowed), it will be interesting to see how the programs approach the two theaters differently. For various reasons - the atom bombs, the internment camps, the viciousness of fights on the islands, the obvious racial difference between Japanese and (most) American soldiers, and the proximity of Nazism - the different front seem to have been viewed somewhat differently throughout American history. In truth, of course, the Japanese government was just as racist and ruthless as the Nazis. It doesn't seem like many folks were interested so I'll probably skip the commentary on the show. Especially given the fact that neither of you will be keeping up with the show on its initial run, I really can't see how I can avoid deep analysis of the show without spoiling it. The politics surrounding Hanks comparison of the Japanese to the Muslim extremists is something that has occurred to many, including me, long before this show aired. But this is a good example of how such a point can be made subtly instead of the overt fabrications Greengrass has to resort to in order to make similar observations.